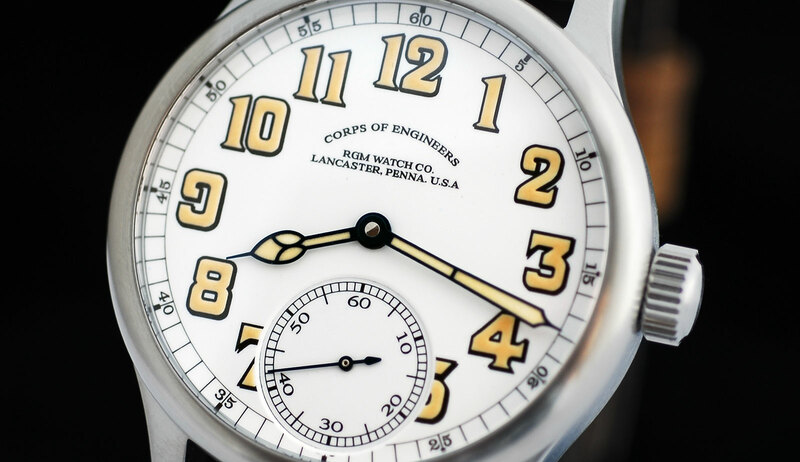 RGM Watch Co. introduces modern "Railroad Watch"
The US joined World War I in 1917, and according to RGM Watch Co. by late August of that year they had sent 9 US Corps of Engineers railway regiments to France. By that time the COE had already adopted the General Railroad Timepiece Standards of 1893, and so they brought 1,000 American-made Hamilton railroad pocket watches that met those standards. According to Railswest, based on the standards of 1893, a “Railroad watch” must have: no lid over the dial, a large diameter plain white dial, bold dark colored hands, bold Arabic numerals, winding stem at 12 o’clock. A minimum of 17 jewels, a double roller, steel escape wheel, micrometric regulator and grade on back plate. And maybe most importantly, a railroad watch had to keep time accurately within 30 seconds +/- per week. Just last week, RGM announced the 801 Corps of Engineers watch, inspired by the original “railroad” pocket watches. The watch is presented in a 42 mm by 10 mm brushed stainless steel “pilot-style” case. Interestingly, it features a Grand Feu fired enamel dial, which translates to “great fire” in French and is representative of the 800C+ temperatures required to turn powered glass particles, that are placed on a metal dial (typically brass), into a beautiful translucent white enamel dial. The process to bake the enamel requires multiple layers, for instance, the outline for the Arabic numeral hour markers, the train track style chapter ring, the small seconds subdial and the logo – are all baked into the dial separate from the base layer. And each time a layer is added – and the dial is re-fired – it increases the chance of damage. This is the risk in making enamel dials. That said, the benefit is a dial that is both aesthetically pleasing and very durable. As you can see from the picture, once the dial is done with the enameling process, it still lacks the luminous material. At that point RGM hand paints Superluminova in between the outline for the numerals. The large, blued-steel, poire squelette-shaped hour and minute hands are also filled with Superluminova. Luminous dials are of course a modern improvement that was not available on the original railroad watches. The RGM 801 COE is powered by RGM’s in-house, American made, caliber 801 hand-wound movement. The 801 bridges are hand chamfered and polished, the steel components are blued by hand, the mainplate has been decorated with a perlage finish and the bridges have circular stripes (Geneva stripes) – all done manually or by hand. The main components come in a choice of rhodium (shown) or gold-plated finish. Technically, the 19 jewel movement beats at 2.5Hz (18,000 vph) and has a 44-hour maximum power reserve. A 7-tooth winding click is standard (a wolf’s tooth winding wheels is available as an option). Protecting the dial is a slightly curved sapphire crystal, with a flat crystal on the back. The crown is flat, and has a vintage style. Water-resistance is 50 meters. The 801 Corps of Engineers watch (Ref. 801-COE) is paired with a brown Tuscan calfskin strap ($9,700), or a metal bracelet ($10,450). Limited to 100 pieces. Switzerland, Japan and Germany make the majority of the high quality mechanical watches that are sold around the world – but if you do really want American made, this is it. And if you like railroad watches, this is an excellent example. Furthermore, they even seem to have mastered the look of faux lume. For more, visit RGM Watch Co.